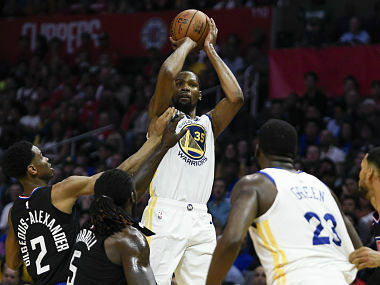 Los Angeles: The Golden State Warriors clinched the Western Conference's top seed with a victory in their final regular-season contest at the Oracle Arena, beating the Los Angeles Clippers 131-104 on Sunday. Stephen Curry led the charge with 27 points and Kevin Durant added 16 as the Warriors won their fifth straight game. 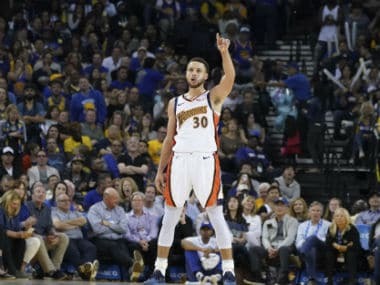 They wore throwback "We Believe" jerseys in a move designed to honor the past at Oracle, which has been their home venue for 47 years. The team is moving across the bay from Oakland to a facility in San Francisco where they will play next season. "Let me just say that for 47 years, Warriors fans have stuck with us through thick and thin," Kerr told the crowd moments after the final buzzer. "Let's be honest, most of those years have been a little thin." The win gives them home field advantage throughout the West playoffs. 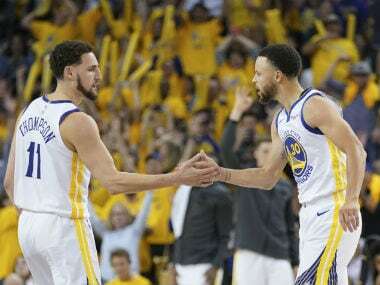 The Warriors' first-round opponent, which will be the eighth seed in the West, is yet to be determined. There is a chance it could be the Clippers when the playoffs begin next Saturday. 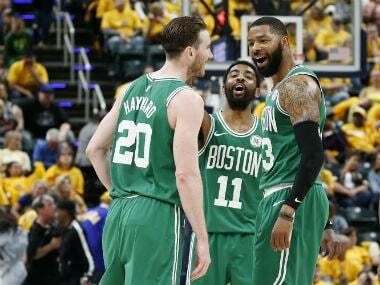 They are battling Oklahoma City (47-33) and San Antonio (47-34) -- both won on Sunday -- for the sixth, seventh and eighth playoff spots in the West. Elsewhere, the Houston Rockets continued their three-point assault on the NBA as they drained a record 27 from beyond the arc in a 149-113 win over the Phoenix Suns. The Rockets broke their own league single-game record with the help of 30 points from James Harden. 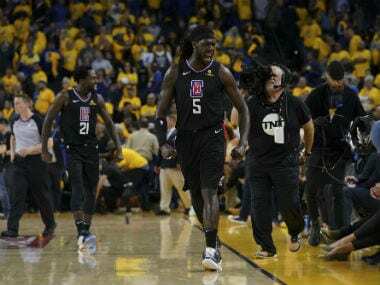 It came just five days after they tied the mark, initially set against the Los Angeles Lakers in January, with 26 against the Sacramento Kings. They now have four of the top 10 three-point games. The Rockets made 27 of 57 threes and seven players hit at least two threes, including Eric Gordon who had a career-high eight, Harden who had five, and P.J. Tucker with four. Austin Rivers broke the record with 69 seconds remaining after Gary Clark had tied it two minutes earlier. Elsewhere, the Miami Heat edged closer to being eliminated from the playoffs for the second time in three seasons on Sunday after a 117-109 defeat to the Toronto Raptors. Miami entered the game with their destiny still in their own hands, knowing that victories in their three final regular season fixtures would carry them into the postseason. But an agonizing loss -- they were leading by 13 at one point in the first half -- means Miami were now sweating on results elsewhere to have any chance of progressing. Sunday's loss left Miami with 38 wins and 42 defeats for the season. Miami icon Dwyane Wade, who could grace an NBA court for the last time when the regular season draws to a close on Wednesday, finished with 21 points. In Minnesota, Russell Westbrook and Paul George combined for 54 points and Dennis Schroder had 14 in the fourth quarter in Oklahoma City Thunder's 132-126 victory over the Timberwolves. "That's just what he does," said Timberwolves guard Josh Okogie, who was given the unenviable task of guarding Westbrook. "He has great teammates around him that can make plays. He's a playmaker himself. He's aggressive, rebounds and can get to the rim." Karl-Anthony Towns led Minnesota with 35 points, while Andrew Wiggins scored 24 and Dario Saric added 23.